Document Logistix creates document management solutions that help to eliminate the use of paper, improve records management and automate business processes. We provide our uniquely affordable and scalable document management software (Document Manager) to an ever expanding range of SME and blue chip clients around the globe. Document Manager provides a flexible platform for completely paperless business processes and highly efficient archiving. Our software powers the operations of some of the world's most demanding, high document volume businesses including major logistics companies like DHL and CEVA. 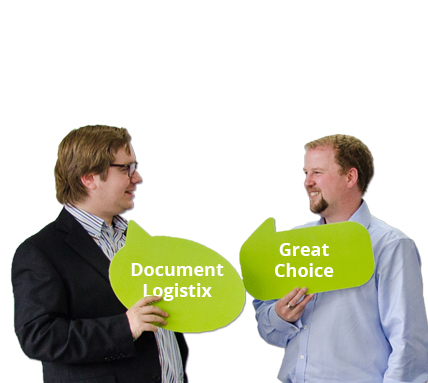 At Document Logistix we pride ourselves on a commitment to providing simply the best DM software available, at the best price. Document Logistix's affordable and scalable document management and archiving software enables businesses to manage their internal paperwork and workflows more effectively, to cut their dependence on printers, to accelerate invoice approval processes and to reduce their carbon footprint. All of this ensures a rapid ROI on their investment in DM software. Our fully electronic document management (EDM) solutions also incorporate a range of specialist DM software modules that enable bulk document scanning for archiving, thin client web DM system access and streamlined invoice and purchase order processing. Document Manager powers the business process automation and content management (ECM) of major companies in a variety of industries around the world. In the UK, our document management software powers the streamlined and paperless business processes of DHL and Lex Vehicle Leasing.. It accelerates invoice processes and delivery document management for Spirax Sarco. It improves customer records management for Price Bailey and improves document storage (of Gift Aid forms) for Asthma UK. In the USA, Document Logistix provides enterprise content management solutions (ECM) to a number of police departments and other federal organisations. We provide large clients like the Virginia State Police force and the Texas Department of Public Safety with a full ECM solution which enables all types of paper documents to be scanned, indexed and archived“ dramatically improving their business efficiency and the security of their customer records management. Our UK and EMEA document management operations are headquartered in Milton Keynes, UK. This facility also is the central point of product development, technical support and training. There is also a high volume business document scanning and indexing bureau service based in our Milton Keynes facility, which can provide a high volume scanning and document management service to clients who need to turn their paper files into digital files within their document archive. This service is perfect for business clients with very large volumes of legacy paper documentation and records that require document management storage and archiving. Austin, Texas, is the US headquarters of Document Logistix Limited. The US branch of the company trades under the name Document Logistix (US). Our US DM software operation has major contracts with the Texas Department of Public Safety, the Virginia State Police and various agencies in other states. Pay only for the software licences that you need and get more from a bureau service.